Aims: In vitro, beta cells immediately secrete stored but readily releasable insulin in response to a rise of glucose. During a prolonged insulin response, this is followed by newly synthesized insulin. 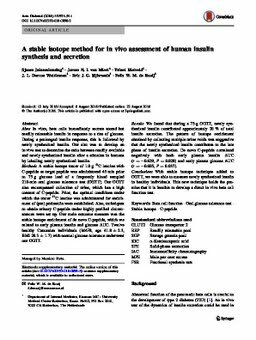 Our aim was to develop an in vivo test to determine the ratio between readily available and newly synthesized insulin after a stimulus in humans by labelling newly synthesized insulin. Methods: A stable isotope tracer of 1.0ï¿½g 13C leucine with C-peptide as target peptide was administered 45ï¿½min prior to 75ï¿½g glucose load of a frequently blood sampled 210-min oral glucose tolerance test (OGTT). Our OGTT also encompassed collection of urine, which has a high content of C-peptide. Prior, the optimal conditions under which the tracer 13C leucine was administered for enrichment of (pre) proinsulin were established. Also, techniques to obtain urinary C-peptide under highly purified circumstances were set up. Our main outcome measure was the stable isotope enrichment of de novo C-peptide, which we related to early plasma insulin and glucose AUC. Twelve healthy Caucasian individuals (M4F8, age 41.8ï¿½ï¿½ï¿½2.3, BMI 28.3ï¿½ï¿½ï¿½1.7) with normal glucose tolerance underwent our OGTT. Results: We found that during a 75-g OGTT, newly synthesized insulin contributed approximately 20ï¿½% of total insulin secretion. The pattern of isotope enrichment obtained by collecting multiple urine voids was suggestive that the newly synthesized insulin contributes to the late phase of insulin secretion. De novo C-peptide correlated negatively with both early plasma insulin AUC (rï¿½=ï¿½−0.629, Pï¿½=ï¿½0.028) and early plasma glucose AUC (rï¿½=ï¿½−0.605, Pï¿½=ï¿½0.037). Conclusions: With stable isotope technique added to OGTT, we were able to measure newly synthesized insulin in healthy individuals. This new technique holds the promise that it is feasible to develop a direct in vivo beta cell function test.